If you are an avid user of mobile data, then you are probably familiar with 4G. Often stamped on sim packets and phones, 4G stands for the fourth and latest generation of wireless technology. It provides the fastest mobile data speeds achievable in the present day. However, this might no longer be the case a few years from now. Works on 5G —dubbed as the next generation of cellular connectivity — is well underway and is expected to be available just a few years from now. 4G vs. 5G: What’s the difference? One of the determinants of a new mobile phone generation is the significant improvements one generation has over its predecessors. 1G signaled the beginning of mobile phones by making wireless communication possible through analog networks which would later be succeeded by digital ones by 2G, who also introduced SMS messaging. Mobile internet was introduced come 3G and was further improved and eventually succeeded by 4G which brought broadband internet speeds to the mobile phone. 5G aims to replace 4G by bringing improved data connectivity to mobile devices. 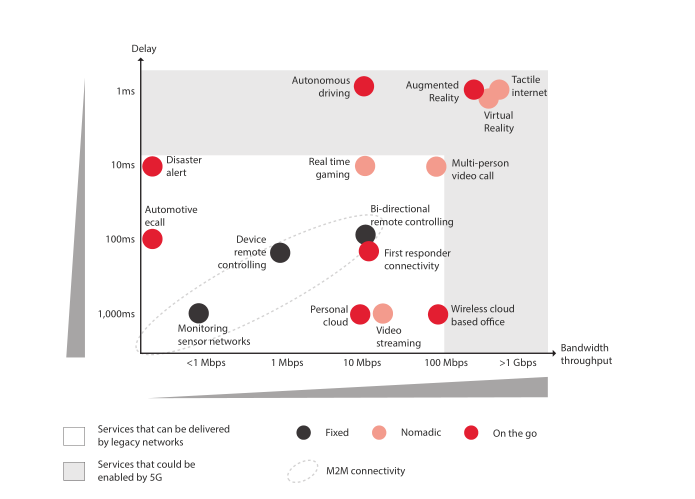 Boasting gigabit data rates, 5G will be 1000x faster than existing 4G technologies. One of its proposed defining features would be <1ms latency which, when implemented, would be 50x faster than what 4G is currently capable of. These requirements, however, take root from the visions of differing companies and groups, which means that 5G will not necessarily include all the specifications listed. Likewise, no potential usage case of 5G requires these to be simultaneously met. Instead, the serve as guiding principles in developing the aspired cellular network. 3GPP, a global collaboration between several telecommunications organizations, has developed a new air interface for 5G. This new interface would utilize radio frequencies in a wider variety of spectrum bands — typically those in the higher frequencies — and is designed to improve the performance of current networks. In order to achieve the expected latency of 1ms, it is determined that the position of a service host should be in close proximity of a user’s device. Due to this reason, the usage of many small cells — short ranged cellular access nodes — to create a dense network is vital for the implementation of 5G. To meet the increase in bandwidth necessary for 5G, high-order MIMO (Multi-Input, Multi-Output) is to be applied. Today’s 4G base stations have 12 ports for antennas that handle cellular connection. Using massive MIMO, these base stations can now accommodate over a hundred ports allowing it to handle more requests from more users at once. Through beamforming, access nodes can focus a stream of cellular signal to specific users rather than transmitting it in all surrounding directions. When the increase in the number of small cells will be implemented, beamforming will help in avoiding signal interference between base stations that can be caused by the implementation of massive MIMO. Once 5G rolls out, it will revolutionize the realm of mobile connectivity by bringing high speed wireless networks comparable to that of a fiber optic connection. However, aside from bringing fast download speeds and enhanced internet browsing experiences to your mobile devices, 5G can also have the potential to be used in an even wider array of tasks. Mobile networks would soon be able to connect to more devices, opening up opportunities to develop new smart products. It also possesses the ability to further improve the Internet of Things. Using 5G, more and more devices can receive a fast and stable connection to the internet. From security to energy management, from home appliances to traffic control, 5G might soon pave the way for the construction of smart cities. High performance network connections with low latency will also become viable for use in the development of technologies involved in critical tasks such as autonomous methods of transportation. Though a real 5G network is still being worked on and its method of implementation uncertain, the biggest companies in the industry are are now performing trials and are making steps in making it a reality. Progress is constant and have speculated that it would start to roll out at around the year 2020. At the time, we cannot foresee what effects the release of 5G will have on the world and whether or not we’ll be watching 4K videos on our phones soon. However, one thing is for certain: the future is coming — and it will be fast. Aug. 2, 2018, 6 p.m.